How exciting!! It is the first of the three day Creative Cuts & More A Very Merry Caardvarks Holiday Hop. If you didn't come from Sue-Anne's blog, be sure to start at the beginning HERE for a chance to win some prizes and to check out all the details. As a new member of the Caardvarks Crew, this is my first chance to get to share some projects with the new and very creative Caardvarks design team members as well as the Creative Cuts & More design team. The theme is holiday to help you get a jump start on your holiday cards and projects. I had lots of fun creating projects with these great cuts from Creative Cuts & More. For the first day, we are creating holiday cards. My card is the picture frame fold-up card. I also used the picture frame fold-up envelope and a snowflake to decorate the envelope. I used a blanket stitch for the inside of the window on the card. Check back tomorrow for another inspirational day of blog hopping. It's a beautiful card! I love the blanket stitch and that giant snowflake is amazing!! Amy, your card is gorgeous!!!! This is a great card! Thank you for sharing! Beautiful! Red and brown look so good together here. You don't kid around do you. Love this! Awesome project! We are so happy to have you on the Team, Amy! Wonderful card! That blanket stitching is such a great touch! Oh, that hand stitching is wonderful. What a nice touch. Love that cut out title. Great card. This card is so gorgeous, Amy!!! Love the colors and the blanket stitch looks totally great!!! That is just beautiful, love your card. Amy, this is a real treasure! The idea to stitch around the window is nothing short of brilliant!! Your blanket stitching here adds the perfect detailing! Love it! What a cleaver little card. I love all the detail work. Beautiful work! such pretty color choices! 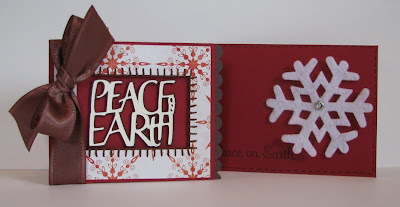 love the snowflakes and your stitching--and is that peace on earth a cut from your Cricut? great blog hop card > it really shows off your lovely card sense. love the simple elegance of this set. congrats on joining the caardvarks team. Wow. Gorgeous. I like that stitch. I must try also. This is gorgeous - love that stitching. The stitching detail is so cool! Lovely card...the stitching is such a great touch. Looking forward to seeing more of your work as a DT member. TFS. Love the snowflake. Love the color. Just perfect foe X'mas. You sure are setting the bar high for your first time on the design team - what a great card! 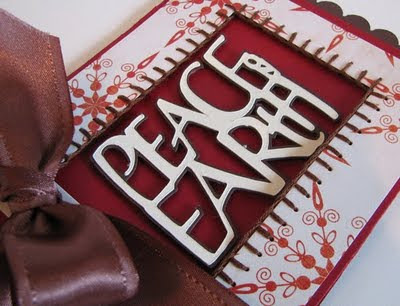 I LOVE this card...I love the bow and the stitching, my goodness!!! Stunning card Amy Great Job! Love your big ol' snowflake! Very cute card! gorgeous! love the decorated envelope too! Ohhh this is perfect for the Christmas season - Beautiful! Gorgeous -- that stitching is such a warm and cozy touch. Very nice card - Love the BIG ribbon!! Absolutely beautiful Amy! That stitching gives it such a warm homey feel! Amy such a beautiful card and this blog hop is so fun! wow! the colors are delicious! I think it's beautiful and fun! TY for the inspiration! Oh love this! The colors, the theme, that snowflake!!! BEAUTIFUL! Love the stitching, the color combo and the snowflake is fabulous! A stitched window--now that's a clever idea. LOVE the layout & the felt snowflake. Looks divine! Lots of hard work that looks Beautiful! Thanks for sharing! Beautiful card-I love it all! Lovely! The stitching makes the whole thing "pop"! Beautiful color choice!